If you had previously cruised on the Carnival Destiny and now climb aboard the Sunshine, you will feel a slightly disorienting sense of coming home. This is because in 2013, the former became the latter after a $155-million dollar extreme makeover that took place over the course of 2.5 months. The Sunshine sports a gross tonnage of just under 103,000 and was born anew after a refresh of the dining options, kids’ camp, spa, guestrooms and so much more. All Carnival Sunshine rooms make efficient use of space and each are furnished with a flat-screen TV mounted up high with a swivel function, a phone, safe, and a pair of bathrobes. Twice daily housekeeping service means you’ll always have fresh, clean towels and well-made beds. Your steward will keep you stocked with ice and take care of any other wishes you may have. Be sure to have a conversation upon checking in and you’ll be in good hands for the duration of your cruise. The housekeeping button on your stateroom phone rings your steward’s cellphone directly so service is prompt and courteous. Turn-down service at night includes the famous Carnival towel animals (keep an eye out for a precocious monkey hanging from the ceiling), sweets and a copy of the Fun Times newsletter outlining the next day’s activities, performances and more so you can properly prep for the fun ahead. Windowless rooms may seem uncomfortable on paper, but when cruising you tend to spend so little time in your cabin in may not be an issue for you, especially when you factor in the greatly reduced cost of interior rooms. Know that inside cabins are on the smaller side, with either two twin beds oriented longways or side-by-side to convert into a one king bed. Interior rooms have closets, drawers and a private bathroom with a shower. They’re suitable for couples, but probably not for entire families. Connecting interior rooms are available for the most affordable family cruising option on the Sunshine, however. Ocean View rooms are almost identical to Interior rooms, but offer a small picture window or portholes to gaze out upon the ocean or watch as the ship approaches dock. These rooms include two twin beds that can convert to a king bed, a sofa that converts to an additional bed, three closets, ample drawers and shelves and a small bathroom with a shower. If you really want to be fancy on board the Sunshine but not pay balcony or suite prices, check out the Scenic Ocean View cabin with a floor-to-ceiling window looking out upon the sea. Stunning. These luxurious staterooms feature two twin beds that convert to a king bed, a bathroom with a shower and a vanity area with a large mirror, and a sofa with a coffee table. The balconies have two chairs and a small table, and a childproof high glass railing means there’s no need to worry about your kids being out there to enjoy the breeze and the view. Of course, you’ll want to supervise to make sure no one stands on the chairs or table out there! As you’d expect, rooms with a balcony are more expensive than Interior and standard Ocean View rooms, but they are worth the cost when traveling as a family because chances are, you might have a little one that needs a nap or falls asleep too early causing you to cancel dinner plans. In a balcony room, there’s space for a big room service tray of food and ample elbowroom to enjoy it all. Mom and dad might want to grab a few quiet moments on the balcony while the kids are at Camp Carnival and watch a stunning sunset at sea. Balconies come in slightly different sizes (standard, extended and premium), and some feature an ocean view, while others offer an obstructed view. Tip: Look for a quad balcony room with a pull-down murphy trundle bed to sleep a total of 4 comfortably for a weeklong cruise. There are different classes of balcony suites, with more space available if needed and a Cloud 9 Spa version with alternate d?cor (sea foam green instead of the Sunshine’s standard beige and blue). Note: Balcony rooms feature two 120-volt outlets and one 230-volt to charge your devices, located on the shelf near the phone next to the closets. Hidden beneath is a comfy ottoman to sit on or to put your feet up and relax. Suites on the Sunshine come in three varieties: Grand, Ocean and Cloud 9 Spa. Each is similar, with large balconies and enough space to have a small family dance party (something you certainly aren’t doing in any other stateroom category). In each suite, two twin beds convert to a king bed. Suites feature full bathrooms with showers, with whirlpool tubs in the Ocean and Cloud 9 Spa version. Suites have double sinks, as well as sofas, armchairs, coffee tables, walk-in dressing areas, vanity tables and two closets. 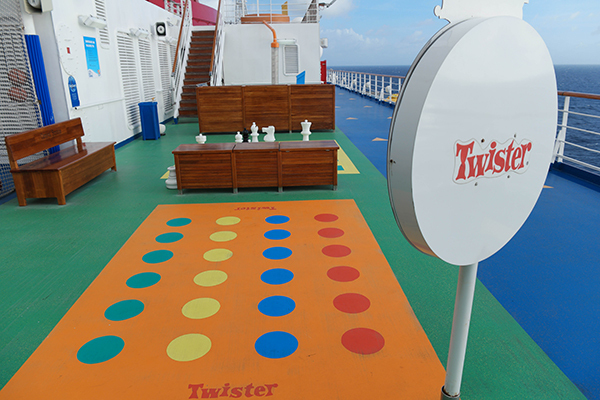 Located on the top deck of the rear of the ship, the kids’ camp on the Sunshine provides children ages 2 to 11 with full days and nights of dance parties, video games, crafts and the opportunity to make new friends during their vacation at sea. All camp activities and dinners are free. Camp Carnival’s Night Owl program aboard the Carnival Sunshine gives kids the chance to stay up way past their usual bedtime for movies, dancing and more fun for a small fee ($6.75 per child, per hour, plus gratuities) while mom and dad enjoy nighttime grown-up activities at their leisure throughout the ship. Got a sleepy kiddo? Night Owls has a separate area away from the buzz for kids to drift off to dreamland. Also located in the Camp Carnival area is Circle C, a youth program for kids ages 12 to 14, and Club 02, the onboard destination for older teens (15 to 17) to hang out and chill. There’s one small, chilly pool in mid-ship and a pair of oft-crowded hot tubs, as well, but kids will probably have a much better time getting soaking wet in the splash zone and zipping down the three slides in the WaterWorks Water Park. Kids will love this massive rear ship water park with three huge slides that dominates the profile view of the Carnival Sunshine. Go it solo on the 334 foot long Twister or have a race on the epic 235 feet long Speedway Splash side-by-side slides. Little ones will enjoy going down the purple Mini Racers slides again and again, as well as getting soaked in the SplashZone. From a basketball court to shuffleboard and billiards to Ping-Pong, this active area has something for everyone on board the Sunshine, including a .1 mile track to get in an early morning run before the ship fully wakes up – only 31 laps for an at-sea 5K! Test your fear of heights and your physical limits on this ropes course high above the SportSquare. When you get a calm window of time to try the Sky Course, take advantage of it as this activity will close when the winds are too strong at sea. This challenging 9-hole put put course is at the very top of the Sunshine, encircling the iconic red, white and blue funnel. Colorful golf balls, putters for all sizes of golfers and scorecards are available on either side of the deck 11 steps up to the course. Happening on one evening each cruise, this hilarious live game show takes place in the Liquid Lounge and features full size versions of Connect Four (played as basketball) and Simon Flash! while Monopoly plays an important and fun part of the show as well. You do not want to miss your chance to answer trivia questions for a chance to be on stage! Young book lovers will go crazy for the Dr. Seuss character parade leaving from the Ocean Plaza and culminating with an on stage interactive Cat In The Hat story time, led by your fabulous cruise director. Also available during your cruise are two seatings of a fantastically colorful Green Eggs & Ham Breakfast (for an additional fee of $5 per person). Early evening laughs are available every night for all-ages in the Limelight Lounge. 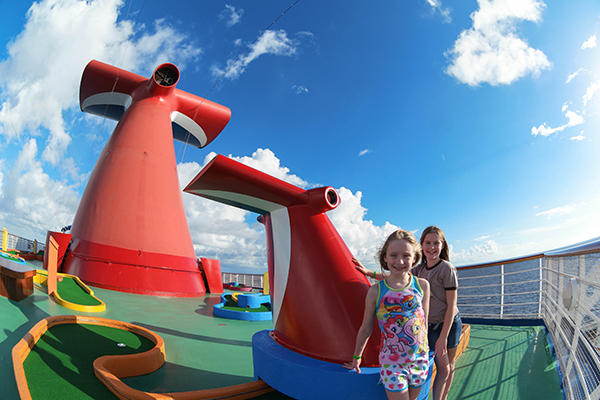 Take your kids to their first stand-up comedy show while at sea on the Carnival Sunshine. The club is intimate and the queue starts to form as early as 30 minutes before showtime, so lineup early for the best seats in the house. 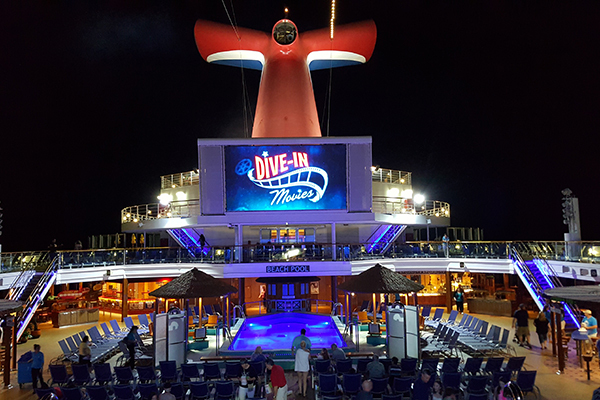 Nightly top-notch movies play on the 270-square-foot screen at mid-ship, so grab a lounge chair, a spot in a hot tub or a stool at the bar and enjoy cinema under the stars. If you don’t want to watch the movie from an angle along the side of the ship, stake your claim to a lounge chair (or hot tub seat) in the center of the ship at least 30 minutes before the opening credits begin to roll. Whether you prefer a stellar Motown show with classic Motor City tunes from past and present, Latin dancing, or an extravagant 80’s night, the musical performances offered nightly in the Liquid Lounge are not to be missed. You’ll be transported back to your favorite time and place thanks to an invigorating mix of singing, dancing and hi-tech background scenes. This classic 24-hour den of beeps, bells and whistles will entertain kids of nearly any age. Whether Skee-Ball is your game or you prefer the nimble attacking challenge of Kung-Fu Panda, there’s an opportunity to collect digital ‘tickets’ to earn prizes like keychains, trinkets or brand new electronic devices (if you plan on spending a lot of time and money in the arcade)! Every day, a new towel animal will be delivered to your cabin and on one morning of your cruise you will have the opportunity to learn how to make several of the fluffy white creatures. Also available is a darling hardback book detailing the history of, and instruction on creating, the famous Carnival towel animals. Called the Lido Marketplace, the buffet options at breakfast, lunch and dinner are immense and diverse. Let’s start at the beginning, with breakfast. You’ll choose from a wide array of popular cold cereals and milk (2%, skim, chocolate), fresh cut fruit and yogurts. The hot breakfast choices include oatmeal, eggs prepared multiple ways (scrambled, Benedict), French toast, pancakes, potatoes, bacon, sausages and more. And then there’s the carbs: bagels and toast (pre-toasted and always cold, unfortunately), pastries (all made fresh each morning), croissants, banana bread and more. Basically, if you’ve ever seen it on a diner’s menu, it is available in the Lido Marketplace. Even the pizzeria is serving up A.M. goodies, and those made-to-order breakfast pizzas are delicious! Around the corner in Ji Ji Asian Kitchen space is a made-to-order omelet station with all the fixings you could imagine. During peak breakfast time, seating in Lido is at a premium, so poke your head into the Havana Bar area for an open table. Lunch and dinner in Lido is a feast for the senses with a massive salad bar with always crisp fresh lettuce hand chopped each day, a deli for all your cold cut sandwich needs, a rotating array of hot meal choices complete with a carving station and always breaded chicken and mac-n-cheese for the more picky eaters in your family. Finally, you’d be crazy to pass up the amazing dessert table with choices ranging from cookies to bread pudding, and from cheesecake bites to slices of pie. There is always a new sweet to sample in the Lido Marketplace. Technically still a part of the Lido Marketplace, the Sunshine has two “poolside” dining hot spots for quick and delicious eats. Guy’s Burger Joint serves up over 1,000 burgers a day and lets hungry cruisers load ’em up with bacon, caramelized onions, pickles, lettuce, tomatoes, BBQ sauce, ranch dressing and more at the toppings bar. On the other side of the pool towel shack is BlueIguana Cantina, your onboard destination for burritos, tacos and other Mexican delights (at lunch and also during breakfast – huevos rancheros, anyone?). Still hungry? The Havana Bar offers tasty Latin-inspired finger food at lunchtime, like Cubano sandwiches and fresh pork empanadas. For a quieter quick dining experience, look to Bonsai Sushi on deck 4 across from the steakhouse. The small room is awash in bamboo green and high top tables giving it a hip lounge vibe. Whether you crave breakfast in bed, a turkey club sandwich, a hot cup of tea, plates of chips and pretzels or a piece of chocolate cake, the Carnival Sunshine room service awaits your call morning, noon and night. The Sunshine’s MDR is open for a sit-down breakfast, but at night it becomes a cavalcade of inventive meals prepared fresh and served in style with waiters who sing and dance. The left side of the menu (shrimp cocktail, steak, salad, crabcakes) remains constant while the right side is changed radically day to day to tempt cruisers with the likes of a duet of meat (braised short rib and filet mignon), bing cherry soup, mahi mahi, scallops and always with a ‘Didja’ (as in, Did You Ever?) choice for those who’ve always been curious about escargot, ox tongue or frog’s legs but were afraid or didn’t want to spend the extra money in case you didn’t like it. On the Sunshine, you can order at will so why not be daring? As high class as any place you’d visit on land, the three specialty restaurants on the Carnival Sunshine, well, shine! If you want some of the fine Italian cuisine, there’s Cucina Del Capitano ($15 per person, but included free during a design-your-own-pasta bar lunch). If you’d prefer a Far East meal to swoon over, make a reservation at Ji Ji Asian Kitchen ($15 per person). Finally, Fahrenheit 555 ($35 per person) is as top notch a steakhouse as you’d find in Chicago or in midtown Manhattan, where the creamy b?arnaise sauce and succulent steamed lobster make for an extremely satisfying surf and turf experience. Whether its hand tossed pizza, cheeseburgers, the pasta bar, or a grilled cheese from the deli, there are plenty of kid friendly foods available throughout the Lido Marketplace. When kids get bored of ice water and lemonade, virgin drinks like Mango Madness and Strawberry Pina Coladas for kids and adults who don’t drink alcohol can be had at any bar onboard the Sunshine. At around $5 each, these cold slushy beverages can add up so make them a special treat instead of a daily one. For kids in Camp Carnival, know that they don’t serve kids lunch (you can pick them up, feed them, and send ’em back in!) but they can and do take care of dinner. The counselors walk the campers down to a side section of the Lido Marketplace where they will enjoy treats like cheese quesadillas, pizza, turkey and cheese sandwiches and more. The menu changes daily and this is also included for free just like the rest of the Camp Carnival experience. Room Service will deliver to you cabin door at any hour, but you’ve got other middle-of-the-night options as well. Pizzeria Del Capitano will pull a hand tossed pie out of the oven for you at any time of day and there’s always the trusty soft serve ice cream and frozen yogurt machines which are never turned off! If you have an ice cream fix not solved by the soft serve machine, the Shake Spot will do with real hand dipped ice cream shakes and floats that can be made “adult” with a wide array of liquors. The space, located in the Ocean Plaza on deck 5, also doubles as a coffee bar with Internet stations to boot. Carnival Sign & Sail cards are distributed to all members of your cruising party and are used as a room key and for all on-board purchases (like those fancy fruity drinks from the bar), as well as for signing your kids in and out of camp. Kiosks on the 3rd and 4th floor mid-ship are available to check your balance. Instead of tipping your servers, bartenders and stateroom steward, Carnival Sunshine charges a one-time gratuity of 11.50 per person, per day. This fee can be paid in advance, or it will be charged to your Sail & Sign account. Be sure to bring some small bills, too, to tip individual crew who go above and beyond to make your cruise extra special. 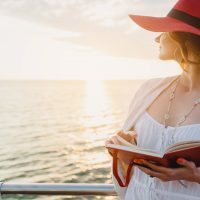 The majority of your cruise will be spent, appropriately enough, in casual clothes like shorts, T-shirts and sandals but it is recommended that you raise the bar slightly for nighttime dining (think sundresses, khakis and a collared shirt, or at the very least your nicest pair of jeans). There will also be a sprinkling of Elegant Nights, where anything from suits and gowns to a sport coat and dress slacks will be in order. It’s not swift, but if you need to work a bit, check email and send photos back to loved ones, the onboard Internet access will suffice. Just don’t expect to be streaming video or downloading new music while on the Sunshine. Cruise-long packages range from $25 for texting only to $60 for access to email, Facebook and the Internet. There is an option, at $20 per bag, to have your checked luggage taken from you the night before disembarkment and not see it again until it rolls down your home airport’s baggage claim carrousel. For everyone else, the standard baggage service will have your luggage waiting for you down at the cruise terminal. The evening before you dock at your home port, a disembarkment zone will be assigned to you with clear instructions on when and where to report the next morning. This means who may have some extra time to grab a bite or play a game before saying goodbye to the Sunshine. Carnival allows each guest to bring one bottle of wine on the ship (a bottle of wine with a twist-off cap will help you avoid corkage fees on board). Other alcoholic beverages are not permitted, but can be purchased throughout the ship. Daily drink specials are often served in souvenir glasses. 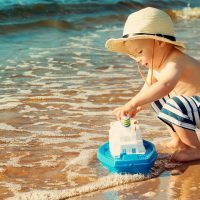 Getting sick or injured on any cruise ship can be an expensive proposition, but know that the Sunshine’s medical center is open 24 hours a day to care for you and your kids if need be. Pills for motion sickness are complimentary. Carnival Sunshine guests are encouraged to limit their checked luggage to two suitcases per guest, each 50 lbs. or lighter. Carry-ons are permitted as well. Feel free to pack light and make use of either the washers and dryers on board the Sunshine or the affordable same day wash and fold service ($15 per bag or $50 for five bags of laundry). Be sure to pack sunscreen, motion sickness medicine and your own snorkel gear if you have it. Small bills for additional gratuities are recommended. Also, the ATM machines charge fees two times the standard on land so having some spending money for while at port is not a bad idea either. You’ll have your photo taken often on board and while getting off and on the Sunshine at port. These photos will be displayed out front of the deck 4 Liquid Lounge entrance and will be for sale throughout the cruise. Candy, jewelry and clothing/gift stores line the deck 4 promenade and there are frequent “sidewalk” sales of watches, necklaces and other fine jewelry during the cruise. Watch the big game happening way back on land or do battle on an EA SPORTS video game on massive screens while enjoying your favorite beverage. Located on decks 10 to 12 at the front of the ship is a 3-level adult-only oasis of calm with its own pool and hot tub. You’ll be so close to the action, but miles away as you relax on padded sofas, cushioned hammocks and tuck yourself away into semi-private bungalow-style huts. Beer Pong, fancy original mixed drinks, a tempting slot machine, or a few lucky hands of blackjack await mom and dad on Deck 5 while the kiddos dance the night away in Camp! Check out a board game or a new book to get lost inside, have a drink and transfer your mobile Internet access to a big computer to send a few “wish you were here” emails from the quiet serenity of this Deck 4 bar. The classic cruise activity is played often onboard the Sunshine in the Liquid Lounge with buy-ins escalating in value and big prize money being dangled in front of hopeful players trying to get five in a row the fastest. 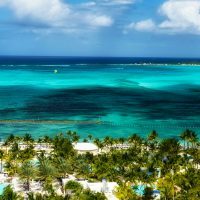 Are Carnival Cruises From Close-to-Home Ports Worth It?